100 Men in Black is an all male chorus. 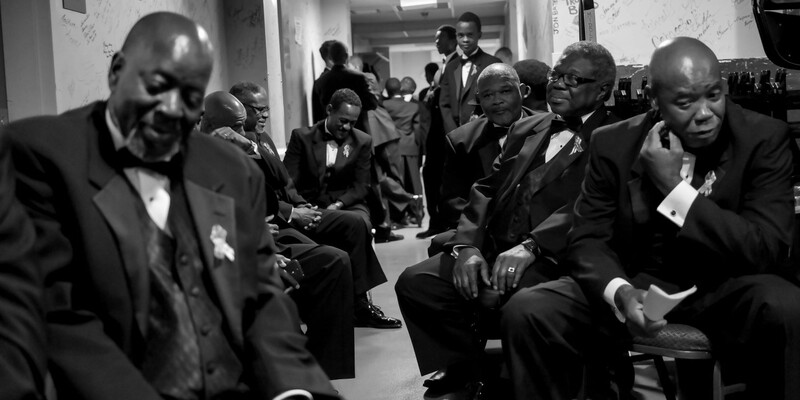 This group was formed under the direction of Marlon E. West in Durham, N.C. 100 Men in Black is an independent, “community-based” male chorus with open membership to all within the Triangle community and surrounding areas. The group is composed of males, representative of all age groups, ethnicities and walks of life who love to sing and share the “good news of the gospel” through music. Our style of music is very diverse. We sing traditional gospel, quartet, spirituals, contemporary gospel, anthems, chorale, patriotic and a capella music. During each annual concert, we have invited guest artists to share in our ministry. To date, we have enjoyed guest appearances by Luther Barnes, Bryan Wilson (former member of Mississippi Mass Children’s Choir), Fred Jones Mime Ministry, Comedians Rodney Johnson and Marcus D. Wiley, Zeb Harrison and the New Life Praise Band, Micah Stampley, and William McDowell. We purpose to distinguish ourselves in various ways. Each year, we select a charitable cause to support. We have made donations to Durham Urban Ministries Community Soup Kitchen and the Labour of Love Ministry. Additionally, we have awarded several $500 and $1000 scholarships to young men enrolling in college. Throughout the year we serve in the following ways: minister in song at various retirement and nursing homes; serve at the homeless shelters; volunteer with an area school(s) to serve as mentors and provide homework assistance to students, and we have formed an ongoing relationship with the C.A. Dillon Boy’s Prison in Butner, NC. Where can I get an application for my grandson to join the youth group you all are starting. Please contact our director, Marlon West, by email (ogmusic1@aol.com) or phone (919-641-0146). Thank you for reaching out on behald of your grandson.